Today I’m going to share ideas for organizing photos and memorabilia. While I talked about schoolwork and artwork in the post on organizing school papers, what about photos and other memorabilia? Whether you consider yourself a scrapbooker or not, this idea from the Organizing Printables Bundle is one to try on for size. 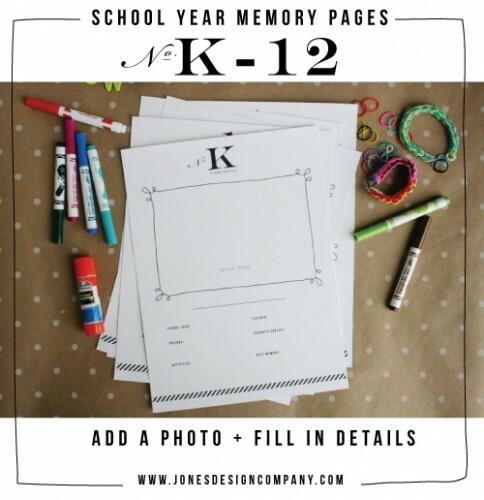 The school year memory pages give you the perfect starting point for a school-days album for your kiddos. My first thought when I saw these was “How cute!” This was quickly followed by “Darn, I wish these were around when my kids started kindergarten!” But then I realized there’s no reason why I couldn’t use these pages retroactively. If you’re like me and have older kids (mine are starting 8th and 10th grades!) then you probably have first day of school photos in various places. Some might be in Project Life albums, older photos could be on traditional scrapbook pages, and yet others could still be on your computer. These memory pages offer a simple fix. First, print out a set of the school year memory pages. Next, grab an empty binder or scrapbook and some sheet protectors. Then, print out your first day of school photos. Fill in the details on the memory pages and slide your pages inside your sheet protectors. Presto! You’ve got the foundation for a school-days album. But why stop there? School photos. I always have tons of these leftover. It will be nice for them to have a permanent home. Last day of school photos. Update: The Organizing Printable Bundle Sale has now ended.